There is no doubt that medical and healthcare applications represent major opportunities for electronic equipment manufacturers and their sensor suppliers. The applications include hospital and clinics, doctors’ offices, remote wireless healthcare, and portable personal area network (PAN) diagnostics and monitoring. ABI Research projects the market for wearable wireless sensors to grow to more than 400 million devices by 2014. The report, “Wearable Wireless Sensors” identifies three broad categories for this growth: health and fitness, at-home health monitoring, and professional healthcare telemedicine. Fig. 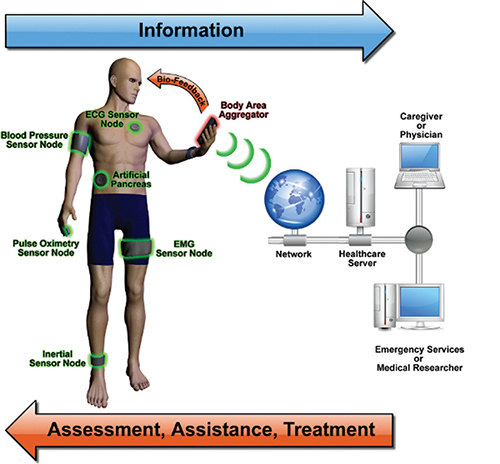 1: Sensors on a patient or anyone who wants to monitor their physiological condition can communicate from a body area network (BAN) to the internet for remote analysis. Source: University of Virginia Engineering. More recently, a new report from ABI Research projects wearable wireless sensors for fitness and wellness monitoring will approach 80 million devices by 2016, growing at a 46% CAGR from 2010 to 2016. ABI Research principal analyst Jonathan Collins has identified the primary reason for the high growth. “These devices don’t require the same level of complexity and regulation to deploy that healthcare devices do,” he says. Using the rapidly improving wireless communication technologies and advanced sensors available today, many companies and universities are proposing solutions for healthcare applications. University of Virginia researchers have described how body area sensor networks (BASNs) can measure physiological, biokinetic, and ambient phenomena. Figure 1 shows the interaction of the sensors and the network. To design these systems, several semiconductor technologies are required. For example, Freescale Semiconductor has a broad range of technologies for body area network (BAN) measurements and communications in healthcare and other applications. They have developed a packaging concept to integrate these technologies into a compact form factor. Figure 2 shows the approach using pressure sensors, gyroscopes and accelerometers. Fig. 2: Enabling technology for a BAN requires several semiconductor technologies and advanced packaging. In this example, the sensing portion consists of a pressure (P) sensor and a six degrees of freedom (6DOF) inertial sensor. Source: Freescale Semiconductor. At the recently held Freescale Technology Forum, one presentation, “Sensor Solutions for the Medical Market” focused specifically on healthcare. The presenters noted that wearable and embedded sensors can already precisely gauge walking speed, stride, step width, and body sway for activity monitoring, physical therapy, and even detecting warning signs that a person might be at risk of falling. Today’s highly integrated and compact 3-axis digital accelerometers, such as Freescale’s MMA8x5x family, provide the sensing technology. Freescale recently announced a new pressure sensor for portable applications including medical devices where the pressure sensor operates at 8.5 µA in low power mode at 1 Hz. The highly-precise MPL3115A2 has high accuracy at 30 cm resolution (20-bit resolution measurement). The sensor also provides a 12-bit temperature measurement in degrees Celsius. The pressure range from 20 to 110 kPA can be sampled at a rate up to 128 Hz. Specific medical applications include respirator equipment, inhalers, and breathalyzers. Figure 4 shows the circuitry and package for the digital pressure sensor. Fig. 3: With the appropriate sensors and wireless technology, several wireless sensor enabled services can be provided to patients such as the elderly. Source: Freescale Semiconductor. When sensors like these are combined with wireless protocol standards such as 802.15.4, Bluetooth Low Energy, and ZigBee as well as proprietary approaches, the resulting body area networks enable numerous functions for end users. Figure 3 shows the types of services that can be provided for elderly patients. However, the same technologies can be used to provide different services for patients with specific conditions or even wellness monitoring services. Fig. 4: In addition to the microelectromechanical system (MEMS) die, several other functions are identified in this block diagram for Freescale’s newest digital pressure sensor. All the circuitry is contained in a 5.0 X 3.0 X 1.1 mm land grid array(LGA) package. Hi , Can I order this product ?